So this is pretty much what I’m going to cover. The essence is the difference between sales pitching and public relations. The internet is great for both things because what you have on the internet is tons of communication lines. These aren’t necessarily people that are going to buy from you, they not even necessarily your correct public. They’re not enlightened on what it is you do, you know, but these are people that you can talk to that you can get to know that – I would recommend people that you help. So that anybody that’s looking for things that are within your sphere, if you give assistance, then there’s an opportunity, there’s someone who will think well of you. So when they do actually need your fine products and services, they’ll be like “Oh yeah, that guy that helped me with that tax question, yeah.” Now I need my taxes done, why not go see that person, you know? So that’s one area, that’s like the sales-type thing where you’re contacting, enlightening, helping and selling, all right? The other side of it though is making your good works known. OK? The internet is great for that. See, here’s what’s going on – there’s your website. Google looks at your website, goes through all of your content, they have robots that are doing this 24/7, they not only look at your website, they follow all the links on your website, OK? And that’s one way they judge you. The other way they jodge you is the people that link to you. These are backlinks. This is the people who link to your website, OK? If you get out a killer press release – something really interesting, really engaging, that gets picked up a lot – every copy of that press release links back to you. I'm Tom Jacoby, my business is Number One On The List. 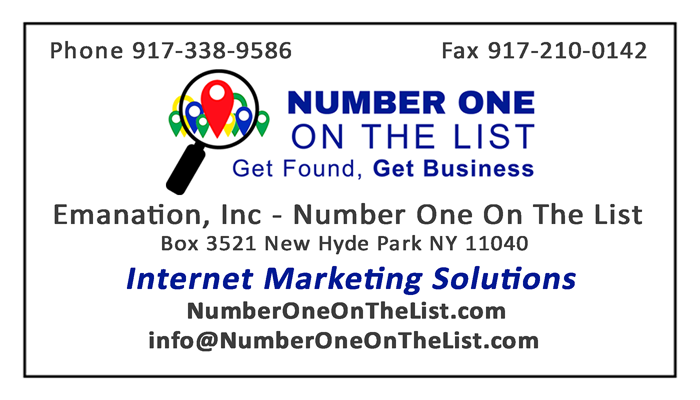 NOOTL has provided Internet Marketing Solutions since 1997, longer than Google. NOOTL does websites to make your vision an Internet reality and Search Engine Optimization help to get your website on top of search results for your products and services.